Earned $327 out of our $1,000 goal for the year! Great job families! Keep on clipping! Box Tops for Education is a program where you cut out the pink box top on hundreds of participating products. Then just turn them in to the office. Each is worth 10 cents for Valley View! Fall submissions due by Oct. 12th. 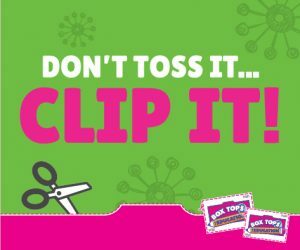 Please make sure to drop all your box tops off at school by this date so we can get credit for them. We will be doing another collection drive in the spring!